I thoroughly enjoyed this book. Whole heartedly and thoroughly - which might seem a bit odd when I tell you about it. She choose to enter the fellowship of Jerry Falwell's Thomas Road Baptist Church in Lynchburg, Virginia in the fall of 2005. Some of you might also clue in that she was also on the outskirts of the Liberty University, which was initially begun by Falwell. 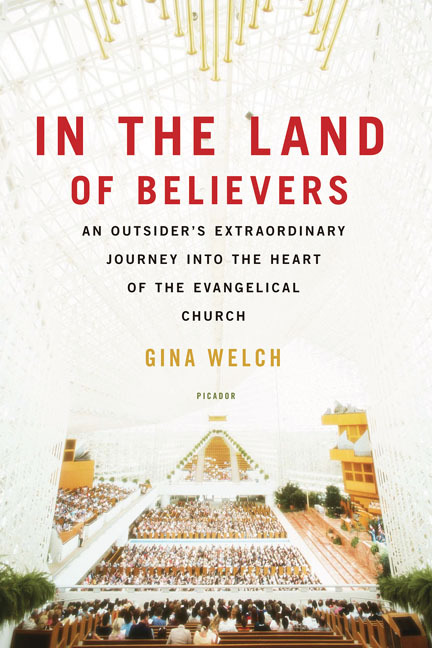 (Falwell passed away during the time Welch was attending the church and so she witnessed death on a grander scale within a Christian community which I thought was interesting.) She came into the fellowship as a self-proclaimed and acknowledged atheist who knew that she would be treated as an outsider if she were to come and simply interview evangelical Christians to try to find out why they believe what they believe. She figured that her best bet was to go undercover in order to attempt to truly understand what makes a self-professing Christian(/society) tick. Her purpose was also political, in a sense, in that she had been raised to dislike and distrust the "radical right wing conservatives." Hers was an honest search, I felt, although there are certainly aspects of it that I heartily disagree with. Why did I love this book? I loved it because it's honest and kind. Refreshingly so. Here is an atheist who essentially says, "I don't understand these quacks" and yet wanted to try to understand them and reveal them and their beliefs to others as best as she could. I read the entire book wondering if by exposing herself so thoroughly to Christians and their society would change who she was. It does, but I think it's something of a spoiler if I explain the exact ways how. I liked reading this book just as much as I liked reading Betrand Russell's Why I Am Not A Christian . As much as Welch wanted to understand Christianity, I think it's fascinating to understand "the other side" as well. It's interesting to me to hear the reasons why someone would outright reject the Christian faith, holding it at bay in disbelief - even when they are holding the evidence right in the palm of their hands, which is the case with Welch. She certainly got a front row seat as to what Christianity can be like. Will In the Land of Believers make Christians wince? Yes and no. I think the best thing that this book may have to offer to Christians is the proof that people are watching what you do and are listening to what you say at all times. If you profess faith in Christ then this book is a good reminder to you to "work out your salvation with fear and trembling." Examine yourself to see if you are dwelling on what is good, pure, holy and of good report. Deal with and submit sin issues to the Lord and repent where repentance is necessary. Ask the Lord to search your heart, know it, and to grant you wisdom to persevere in your Christian walk. Books like these are insightful and helpful to Christians - or, I would think, should be. It's hard for me, in particular, as a life-long Christian to step outside, if you will, and take an honest look inside the church doors. You see, I've always been inside. (A fact for which I am thoroughly grateful, by the way!) I sympathized with Welch in her struggles to understand where I was coming from and yes, I did pray for her as I read through her experiences. I prayed for her understanding and over her life. She had an experience which she testifies has left her a different person. She has been changed. (Not spoiling. If you are a Christian you would find it difficult - if not downright impossible - to believe that someone could immerse themselves so thoroughly among believers and NOT be changed!) I cheered her on. I liked the people she came to like and respected those she wrote about, even if I did not personally agree with them (theologically speaking.) I came to think of her as a friend, someone that I would love to sit and have coffee with or, at least, one that I would certainly want to hear publicly speak of her experiences if she were in my area. And I would seek her out and shake her hand. I heartily recommend In the Land of Believers . I marked so many passages but there is not enough time or space here to go over each one. I'll keep this one on my bookshelf and will happily re-read it again on down the road. Thank you, Picador, for graciously sending me a copy of this book to read and learn from. I enjoyed it greatly! This sounds like that book that an outsider wrote about Patrick Henry College, which I read and enjoyed. Sign me up! What a great review! I would love to win a copy of this book. I am nearly salivating at the prospect of reading this book! giggle It sounds fascinating! Since I often have non-believing family sitting in the same pew as me when they visit us, I am aware (though not deeply...) of how our church is portrayed to the non-believer and to those who have walked away. Great review. This definitely sounds like a worthy book to own! I'd love to read this. I've been to Thomas Road many times when we've visited friends who used to live in the area. Several kids from our church are Liberty students. Does she notice a change between Jerry Falwell & his son Jonathan? I'd be interested to know what she says, if anything, on that subject. Wow, great review!! I would love to win this book, and I definitely plan to recommend it to our book club! Thanks for sharing your insights. KatyD I would love to read his book. Sounds interesting. Sounds like a facinating read! Having been born into a SBC family, a pastor's child, and now married to the son of SBC international missionaries, I am interesting in reading this. Christianity DEFINITELY has its own language! Fascinating review--I'm definitely putting this one on my "to read" list. Thanks! I'm very inteerested inreading this! Please sign me up! Our sisters are both non- believers. I'd love to read this. In the medical world, I try to keep my language as jargon-free as possible. Christians need to do the same. helpful review and a good reminder that there are folks who are watching christians. sounds like a book i could learn from. please enter me into the drawing. A while ago, I read The Unlikely Disciple, about a guy who "infiltrated" Liberty University with similar intentions (did you read that one? I can't remember.). I appreciated Unlikely Disciple for reasons similar to those you outline here. It is good for Christians to see how we are perceived, how we can come across. I'm sure I'd appreciate In the Land of Believers as well. As a graduate of Liberty (who also attended Thomas Road for part of the time we lived in Lynchburg), it is admittedly fascinating to me to read an outside perspective of a place I was so immersed in. Reminds me of The Unlikely Disciple which I found very interesting. Actually, it looks like he was at Liberty at the same time frame. I'm adding this one to my list (would love to win it)! After attending the wedding of a Christian friend, a colleague asked me why we use "just" so much in prayer. Why do you say "We just ask you?" Why not "We ask you?" Another Hindu colleague sat quietly during the Lord's prayer and I heard her explaining "what Christians believe" when her daughter picked up a nativity book at the library. My mother-in-law's take on our church (she doesn't come from a religious background and is only nominally religious) is interesting. I'm glad you chose to review a book that reflects the respect that most non-Christians show Christians. I was disappointed a few weeks ago in Sunday School when someone generalized that non-Christians "hate us". Great review! I've had this one on my list for a while now, but I haven't gotten around to reading it yet (probably due to my list being very long and this book not being available at my library.) But someday, I'm going to get around to reading it. Someday. I have this one on my wish list too. Enter me please. Great review! I'd love a copy. Like Amy, I thought of the Patrick Henry book when reading your review. I would love to read this, it sounds really good. I'm interested! But how could I not be, after having read this excellent review? I'd love to read this book! Although I've never been an atheist, I can relate to the author a little bit. I grew up in a liturgical church where "salvation" was never talked about, so I was confused when I heard people talk about "getting saved". Now, as a member of an evangelical church, and having been saved almost 12 years ago, I "get" it. But I feel real compassion for people who don't get what all that terminology means. Thanks for the great review! This sounds fascinating, but I'd better leave the giveaway to others -- I have so many books stacked up now. I do think it is good for Christians to realize how they look and sound to the outside world sometimes. Recently I googled "how to be born again" hoping to find a link that explained it well enough for me to link the phrase to. One of the first posts came at it from a back alley and used terms only a theology student would be likely to understand. And I thought -- good grief! How would someone who wanted a truthful, clear, simple answer to that question get it here?! Thankfully I did finally find one. This book sounds fascinating. I'd love a chance to win! Thanks for sharing your review. This looks very interesting, Carrie. I read a similar one a couple of years ago, written by a Brown student who studied for a year at Liberty--Kevin something, can't remember the title, but I devoured it! Bummer about losing all those comments. My earlier one actually said something worthwhile (I think). This one will just say "Bummer about losing all those comments. My earlier one..."
This book's been on my TBR list for a while, but I haven't gotten it yet. I'd love to win. Sounds like a great book. Kind of reminds me of Girl Meets God which I enjoyed. Great review! Looks very interesting, I'd love to read it. 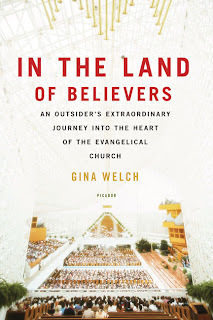 I enjoyed your review and would love to read In the Land of Believers :) *Thanks* for the giveaway! Sounds like an interesting book! Hey... I see that my original comment is still there. Whew! Wouldn't want to miss out. Would love to read this! Thanks for offering this book. I'd love to read it! Gotta love Blogger, huh? I'm still interested!